Okay, the design is complete! I've decided on a White Silk Evening Gown for our excursion to the Opera at the end of September. The dress will be a combination of White Silk with Pearl Beadwork and plain White Silk. 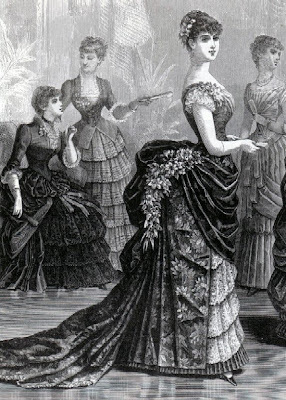 It will have the flower swag across the bodice like the above picture, probably in pink and green flowers. And it will have the same bodice style as above but with buttons down the front. I love the skirt on this dress! This is what the skirt will be modeled after. 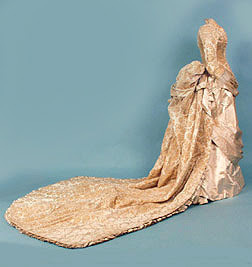 The train will be detachable and will have silk knife pleated underneath like this one. The skirt will also have the knife pleating underneath peaking out. The main part of the skirt and bodice will be in plain silk and the train and bustled swags will all be in beaded white silk. I didn't feel like scanning my sketch, so you'll have to use your imagination! 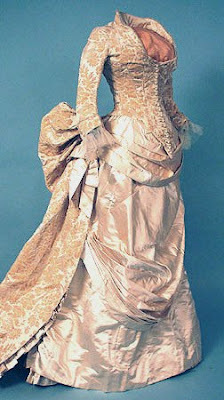 Check out THIS website for more 1880s Evening Dresses! So pretty - so exciting - and so you! Can't wait to see the fabric!